Ensuring that the rights of people who receive last resort financial assistance are respected, whether or not they have been deemed to have limitations to employment. 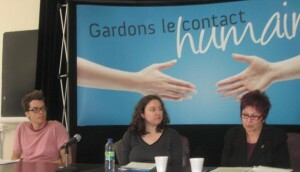 Improving communication towards welfare recipients and humanizing the services offered by the Ministère de l’emploi et de la solidarité sociale. 1. Humanizing of services : That all people who receive welfare benefits be able to contact the agent in charge of their dossier by telephone or in person. 2. Initial Attribution Meeting : That the Local Employment Offices (CLEs) automatically offer everyone applying for financial assistance the possibility to meet with a welfare agent so as to respect article 29 of the Loi sur l’aide aux personnes et aux familles. 3. Delays : Act so that more welfare agents are hired so that all unemployed people can have access to adequate services in their Local Employment Office and so that the delays to access welfare benefits are considerably reduced. 4. Parental Contribution : Abolish the notion of parental contribution, a notion that creates extra steps for youth in difficulty, thus delaying their ability to obtain financial assistance and prolonging their precarious living situations. 5. The Provision of Documents Establishing Admissibility : Ensure that all documents requested to establish admissibility for financial assistance be without charge to the applicant. 6. Emergency Welfare : Ensure that all applicants in situations of destitution have real access to an emergency welfare cheque. 7. Permitted Liquid Assets : That the level of liquid assets permitted for applicants be the same as that for people already admitted to the social assistance program: $1,500 for a single person and $2,500 for a family, as it was before the reform. The CASC is a coalition made up of community groups, regional and national associations, and individuals directly affected by the services offered in the Local Employment Offices. The coalition functions by consensus. The member organisations are invited to participate in the different aspects of the coalition, according to their interests and availabilities. The CASC organises regular monthly meetings and at least one members’ assembly per year. Does your organisation want to support the coalition’s work? 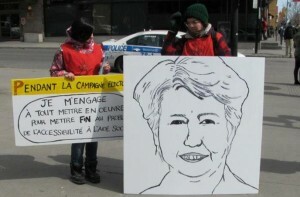 Write to us at info@coalition-cascquebec.org or fill out our membership form.